While paintings in tombs depict the elite’s pleasures and pastimes, they also reveal an attitude to women which is quite different from, for example, contemporary Greek culture. Although the Etruscan drinking parties, and even the after-dinner games, are taken from Greek habits, the presence of respectable married women (identified as such by inscriptions), and not courtesans, illustrates that Etruscan women had rather more social freedom than their counterparts elsewhere. In one tomb painting, three women are spectators at a chariot race, again, something unheard of at Greek sporting events. Further, records show that Etruscan women were literate and enjoyed greater legal rights, too. In Etruria, a woman could inherit family property if there were no surviving male line, not so in Greece. Property ownership and the right to drink wine is additionally proven by graffiti on pottery vessels which tell of a female owner. That women had their own legal personalities, as it were, is further indicated by numerous inscriptions where they are referred to by both their first and family names, a convention not seen, for example, in ancient Rome. Grave goods buried with females from all periods show their important societal role as weavers, but there are even large grandiose tombs built specifically for a female occupant, the mid-7th century BCE Regolini-Galassi tomb at Cerveteri being the best example. Finally, sarcophagi with lids carrying sculpted figures of deceased couples show the husband in the subservient act of anointing his wife with oil, a touching scene not often depicted in the art of other ancient cultures. The Etruscan princess Tanaquil attained lasting fame as a woman “well skilled in celestial prophecies.” [Livy 1.34.9; Dionysos of Halicarnassus, Ant. Rom. 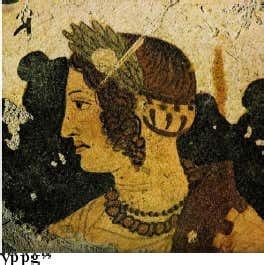 4.3.2] Because her husband was an immigrant from Corinth, he could not advance in aristocratic Etruscan society. Tanaquil encouraged him to seek better fortune in the town of Rome. As they drove there, so legend says, an eagle swooped down and flew off with her husband’s cap, then wheeled around and dropped it back on his head. Tanaquil read this as an omen foretelling Tarquin’s rise to the Roman throne. He became its fifth king, founding the Tarquinian dynasty around 616-579 BCE. Not only did Etruscan wives scandalously go out in public — and entertain lavishly, wear glorious jewellery, indulge a clothing sense that is recorded in frescos, statuary, and the bronze mirrors etched with sometimes rather racy scenes that give us fascinating detail of how fashion changed down the centuries – but they also learned to read and write. (We know the danger of that!) They were rumored to raise their own children, too. Presumably passing along the dire literary habit. The Greeks gradually pushed the Etruscan border back toward the north. Rome expelled its last Etruscan king in 510, and a century later began capturing towns in Etruria. As they colonized the country, its cultural influence remained colossal. Many Roman clans were known to be of Etruscan origin, including the Julii that Caesar came from. They adopted the fasces symbol (birch rods wrapped around an axe) and many Etruscan deities, notably the Capitoline triad of Jupiter, Juno and Minerva (Tinia, Uni, Menrva). Likewise Nethuns shifted to Neptunus, Maris to Mars, Velchans to Vulcanus. They adopted Etruscan technologies of stone-working, architecture, hydraulics and engineering, and their letters were derived from the alphabet as it was used in Etruria. Where the Romans differed most dramatically was in the status of women, with one exception that may be attributed to Etruscan influence: they retained women’s right of inheritance.